Like I struggle with my WP Spam-s-alot problem, I staggered under the multiplicity of options on this machine, and I spent WAY TOO MUCH TIME just learning to thread it. So it sat for probably 3-4 years under my table in the bedroom – forlorn and rejected. Then Connie and Carmen and I got together. Yesterday Carmen agreed to a tutoring session in her home. I thought as I packed up my things to take, that maybe I should take projects that had been bothering me for 10 years or so as well. Then I thought, “I shouldn’t overwhelm her”, but my desires got the best of me. I’ll write about my project on another day. Yes, I took it!! Pass up an opportunity to get help from an expert?? Are you kidding??? What I did forget was my power cord. 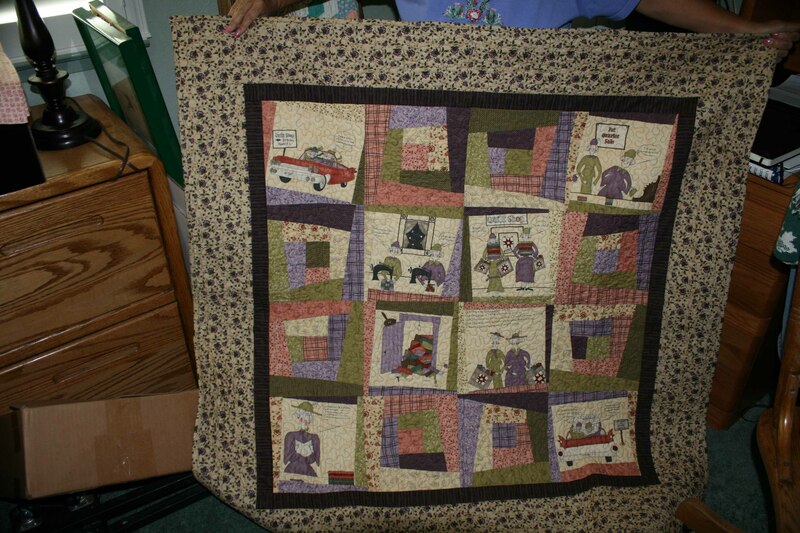 Fortunately Carmen had one, so while she sewed, I took pictures of her quilts. She said I could share them with you. So when you comment, you can thank her. Purchased quilt for the humor of it! Guess which one is me (in 20-30 years). 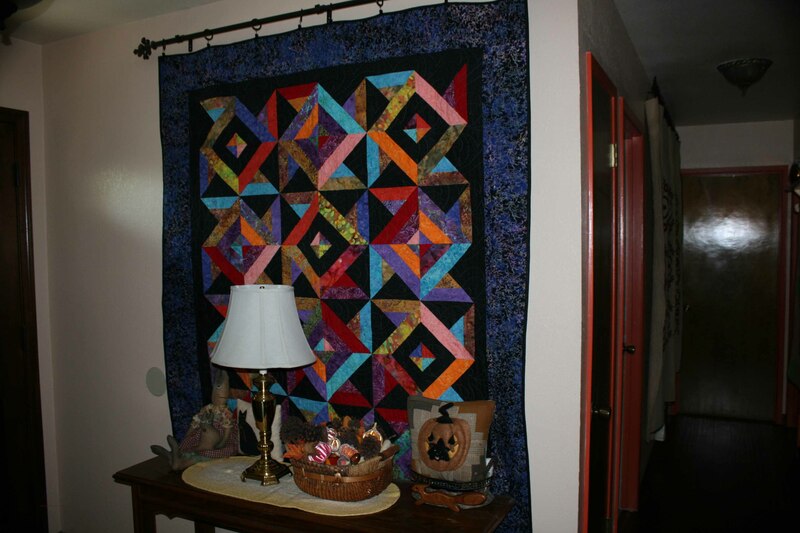 This quilt hangs in her quilting room amid finished and unfinished projects. I’ll back up so you get the bigger picture. The rectangle at the top isn’t a quilt. How many patterns can you name? My guide and I started in the dining room. It’s fall, so this quilt will not be here in a couple of months. Enjoy it while you can. 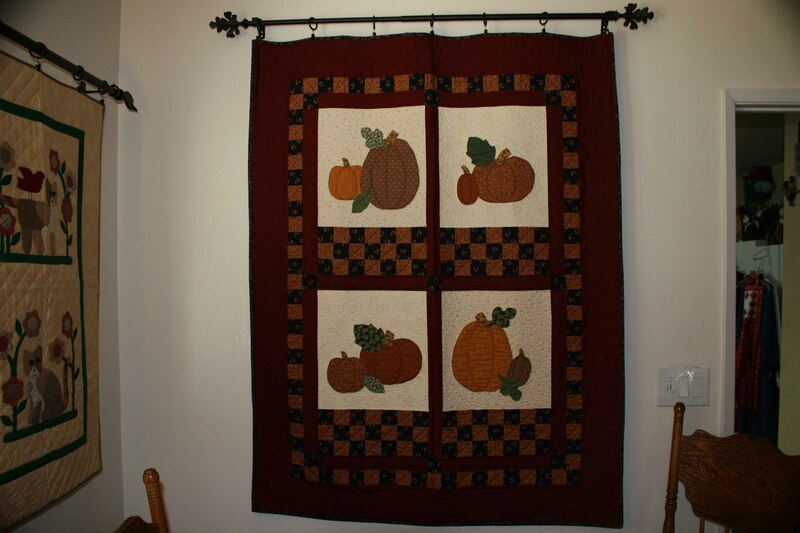 Carmen makes a new pumpkin quilt every year. She tells me she’s not an expert yet because she’s only been quilting for 14 years. That probably means that there are 14 pumpkin quilts. You can’t imagine how much she has done in 14 years! 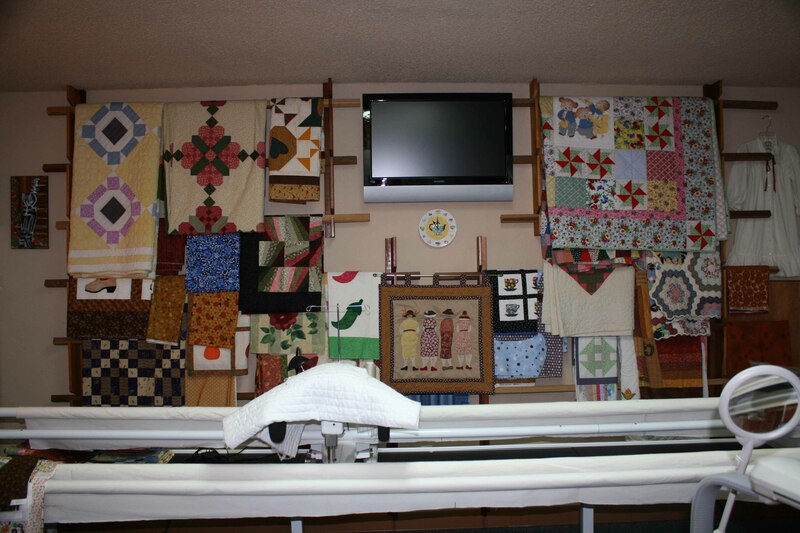 You are not going to get to see even 1/10 of all the quilts Carmen has. Carmen loves and rescues cats. These are some that didn’t need to be rescued. They oversee every meal. 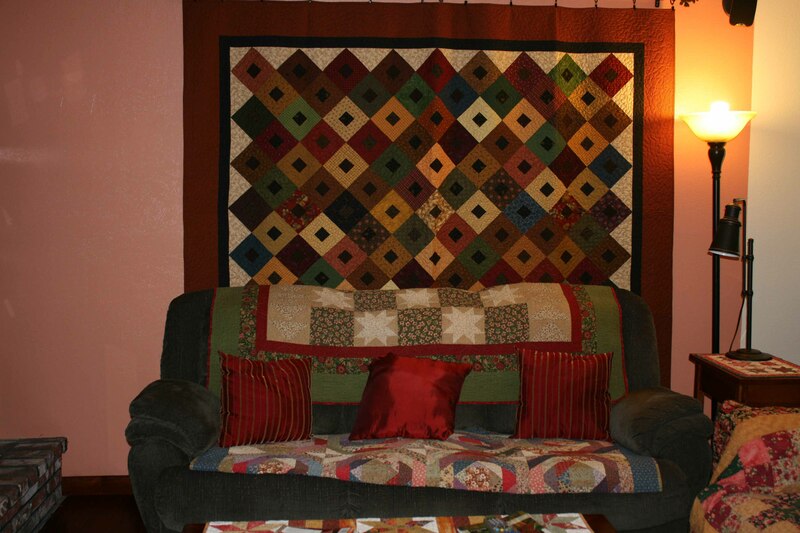 Each wall quilt is hung with a curtain rod. That worked well. 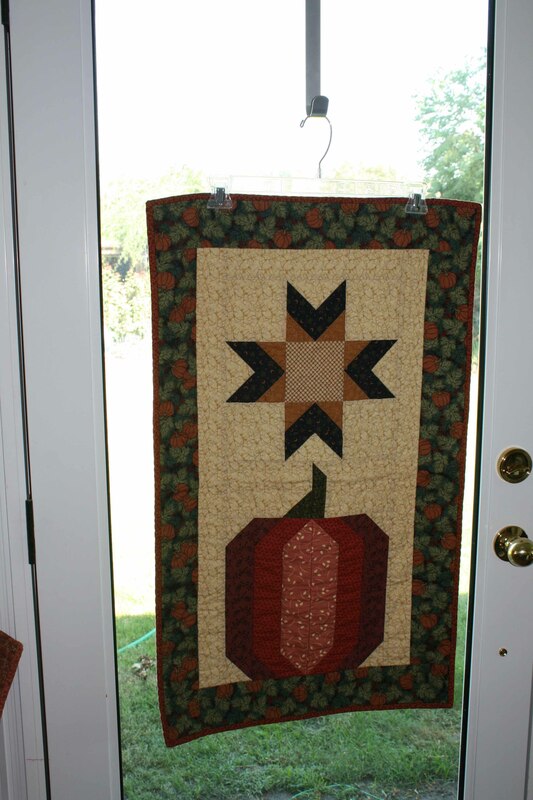 This quilt actually served as a curtain on the door to the sun room. The matching one is on the other French door. The couch, tables, chair and wall displayed more beautiful quilts. I would be all wrapped up in this in the winter time. 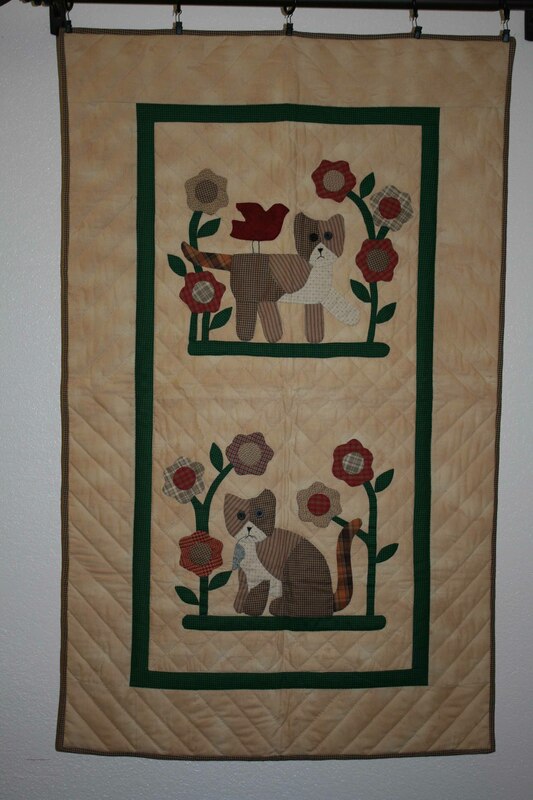 The cats love the quilts. When my friend and I walked into the sunroom I disturbed some of their naps. 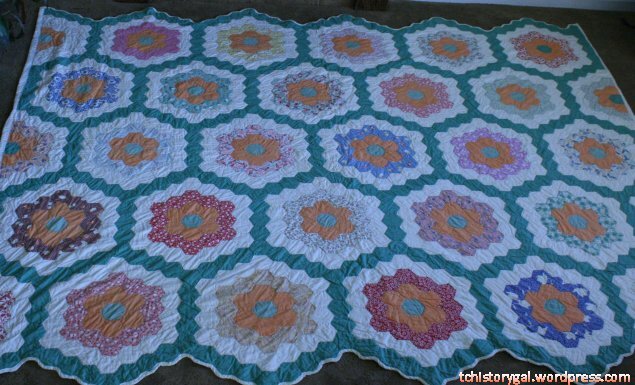 This quilt is unusual for Carmen because it is not precise. The blocks are formed like a round log cabin (maybe a drunkard’s path, but they are not the same size or even shape. The edges are raw, and gain character as the quilt is washed. Perky pumpkin hanging in the window on a hanger. The hanger worked will to hang this perky pumpkin. The star almost looks like a Sojourner Truth Star depending on the colors. My little guide waited politely for me to take pictures of his favorite room. 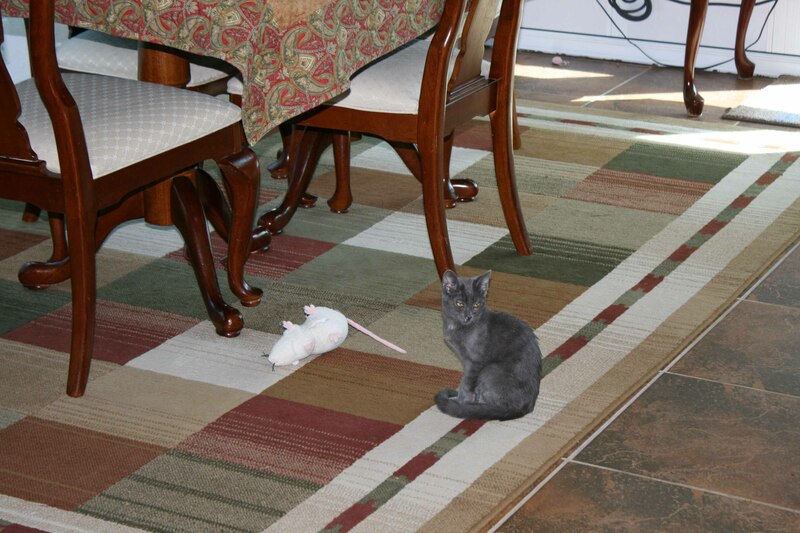 Don’t be alarmed, the mouse wasn’t real! 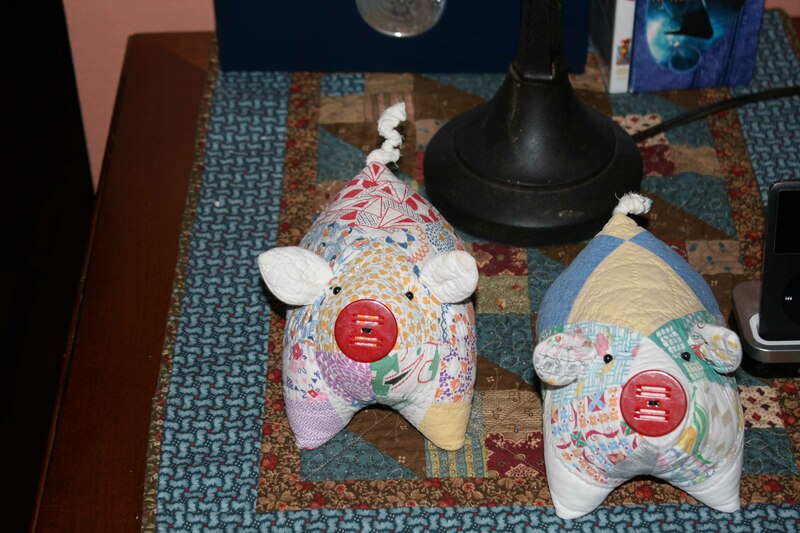 Carmen also likes to make animals – and pillows with animals. I’ll show you a couple of cute pigs. Don’t try putting money in them. They cuddle instead of clink. This should have been my starting place. 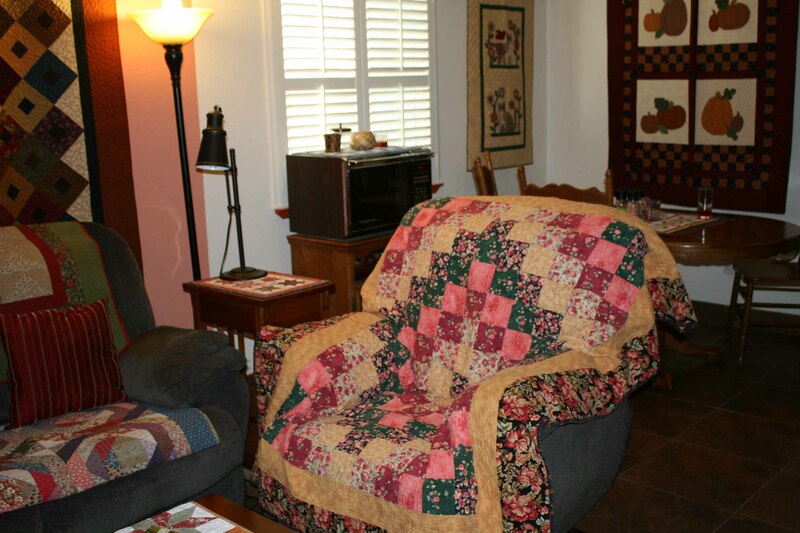 This is her experiment with color quilt – and of course, a pumpkin pillow! Carmen really needs a wider hallway. These next quilts are old. 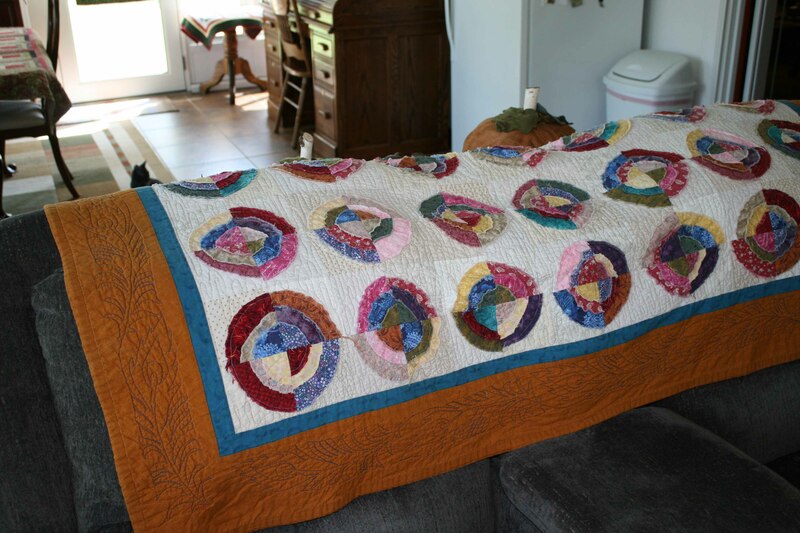 Her husband’s family is Mennonite, and when Carmen started quilting her mother-in-law posted an all points bulletin for relatives to help her start her stash of quilts. They came from all corners of the country, finished and unfinished. Some of these fabrics reminded me of my great-grandmother’s quilt. This beautiful hand-quilted applique had the same pattern quilted into the white background even where there was no appliqué. 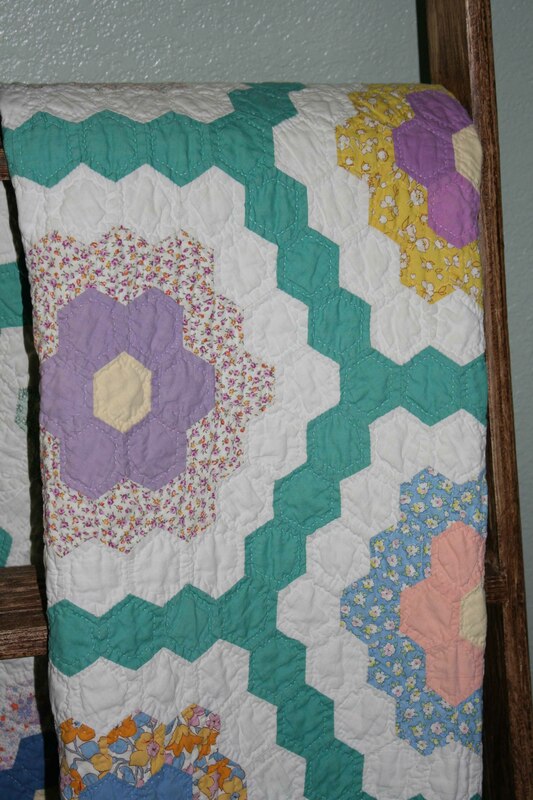 Her Grandmother’s Flower Garden quilt looks very similar to mine. I could almost picture my mother wearing dresses made out of these fabrics. My great-grandma’s gift to Grandma Golda. You can see that my great-grandmother put a binding around the edges of her quilt. 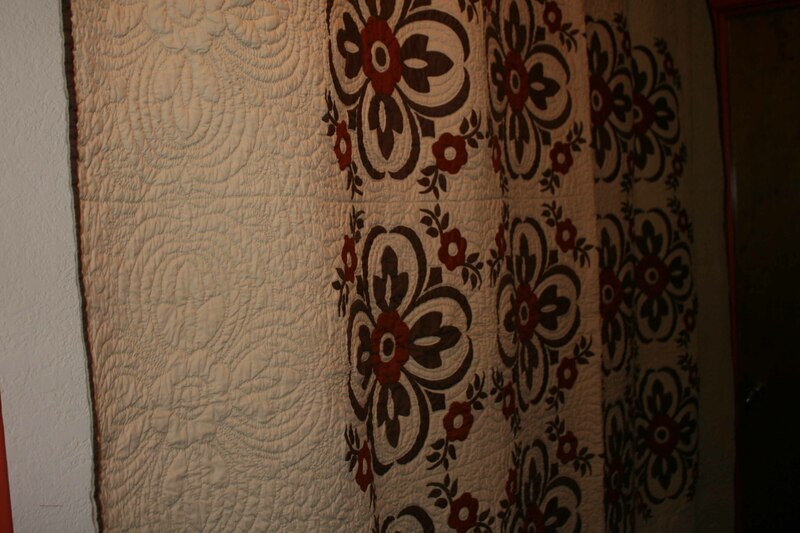 Carmen’s quilt has a blind stitched edging. 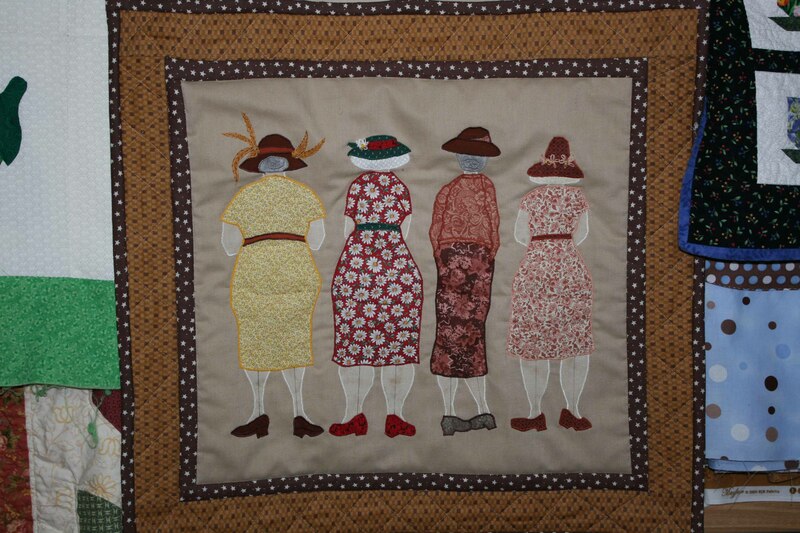 The last quilt we looked at yesterday was a friendship quilt. I appreciated that she opened up her home, not only to me, but to you to share in the beauty of hand made work done over many years. The afternoon passed so pleasantly that when I finally looked at the clock it was 3:00 and I had been there more than 4 hours, listening to Dave Stamey, learning how to use my machine, and fixing a ten year-old quilting dilemma. They are aren’t they!!! Carmen was really generous to let me photograph and post them!!! They are just wonderful. I have to find a class or something so I can learn how. I’ve always admired them, so, I just have to try! 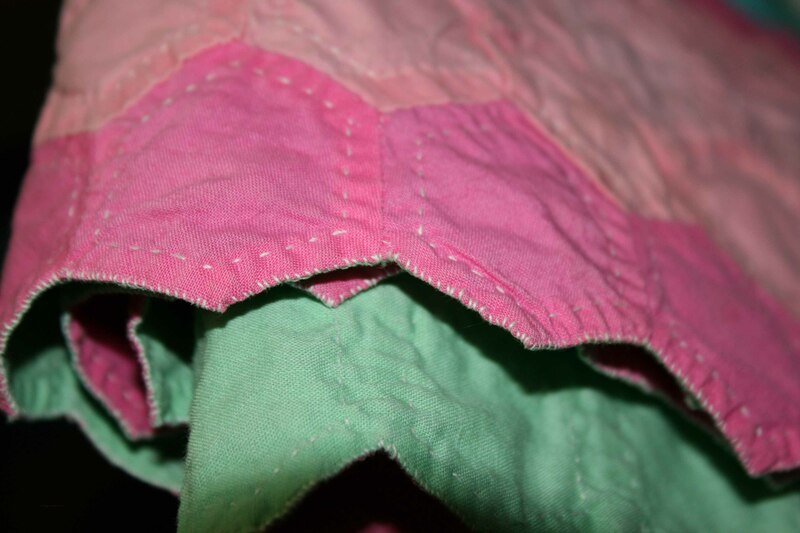 If you can sew a straight line, you can start most pieced quilts with no problem. I would recommend a class, though because there is someone to encourage you, and you make new friends, as well. Thanks for commenting!! My Grandma Rhea made me a Grandmother’s Flowe Garden for mu high school graduation. It has been years since I had time to quilt, but I love piecing together the the colors and patterns. thank you for a very fun post! 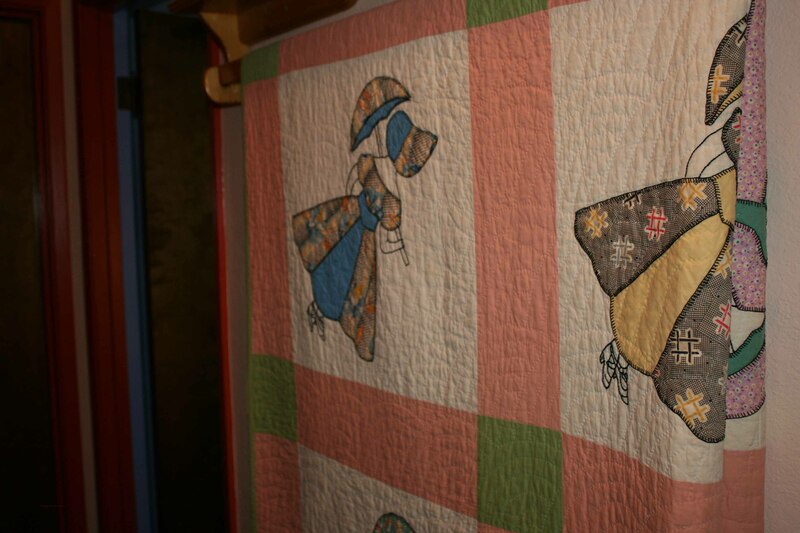 I loved looking at all the quilts. Good luck with yours. Thank you for introducing Carmen’s quilt! Amazing, too beautiful! Thanks Amy, she is one of the best quilters I have met. The thing on the sofa? My favorite!! Carmen doesn’t part with any of her quilts easily. I feel so honored that I was given a quilt for my retirement. She does make them specially for people from time to time. The time involved is SO tremendous that if you ever DO get a handmade quilt – machine or otherwise – you must treasure it! I agree. But seriously they are little pieces if heaven! 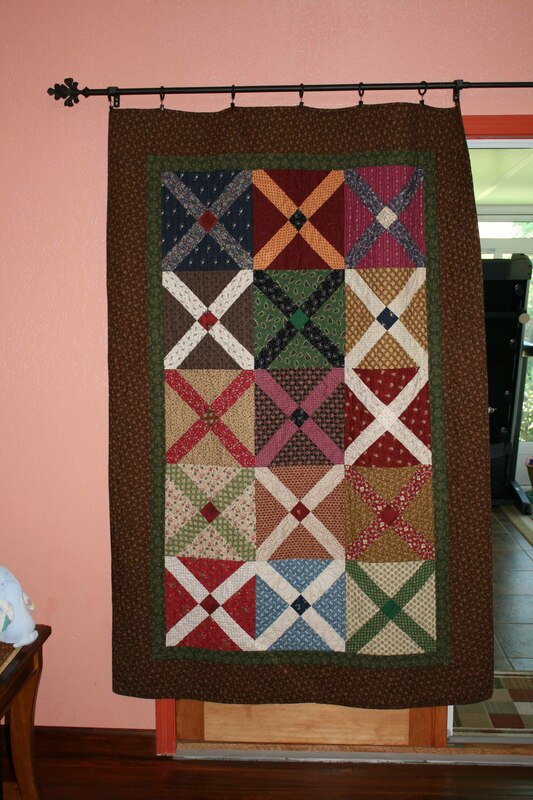 I am going to send a link of your post to my mother, she has just started quilting and loves it. She bought a caravan to put out the back and made it into a sewing room. Be careful, you will be hooked and your home will be full of quilted things, and you will be begging your friends to let you make them quilts, haha. I hope you love it. Now as for the comment above, I do first thing every morning now, I look for you in there. Wow, she really is into it. I told my husband he can build me a new garage, but we’ll see. If I sit that much eventually I’ll need a garage to hold me and all my stuff. I could really get back into this, and there are plenty of gadgets and books to buy!!! WOW! This is like a gallery. She should show it to the public. Perhaps, get with one of those organizers of a fair events or festivals. I mean it, These are amazing creations! I’ll pass that on to her. She thinks of herself as a student of quilting still, but I think she is far past that! Beautiful masterpieces, I like the combination of colours! I think Carmen is masterful with colors. One comment that she made is that now she is almost always using some black in her quilts. That seems to really make them pop. I can see how much work goes in there and how much also Carmen’ s heart does. Black does make the other colours pop out, definitely. WOW!! I’m so honored Rommel. You are so kind. Hope you have a great Thanksgiving. After 14 years, she’s not an expert????? I’d beg to differ!! These are all absolutely wonderful!! My poor 9 patch quilts are put to shame by these gorgeous ones!! You might remember that I quilt too. But I feel like I shouldn’t even say that on a shared page with Carmen!! The ones you showed are all GORGEOUS!! I know!! Bout makes my buttons burst with pride!! See why she’s my BBFF? ?